Find My Workspace lists over 95% of the executive office suites market in Saratoga Springs. Simply click Request Quote to check pricing for one office, or Add to Basket for multiple offices. 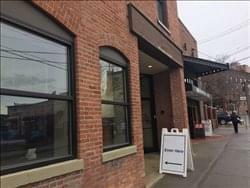 This workspace is a local business community full of members of the Saratoga area, ranging from renewable energy companies and real estate brokers to lawyers and accountants. The center provides private and professionally furnished office space with access to shared spaces that all of the members use, such as large-volume low-cost printing, free high-speed internet, 24/7 access, signage, mailing assistance, reception, and more. Plus, Business Hub members have access to numerous resources that go far beyond the traditional co-working space, including international expansion facilitation, intra-member service exchanges, events, and more, all in beautiful downtown Saratoga.